For the Germanic language that diverged from Middle English, see Scots language. "Gaelic language" redirects here. For the Gaelic language family, see Goidelic languages. For the Gaelic language spoken in Ireland, see Irish language. 87,000 people in Scotland reported having some Gaelic language ability in 2011. Scottish Gaelic (Gàidhlig [ˈkaːlɪkʲ] ( listen)) or Scots Gaelic, sometimes also referred to simply as Gaelic, is a member of the Goidelic (Gaelic) language branch of the Celtic languages native to the Gaels of Scotland. A member of the Goidelic branch of the Celtic languages, Scottish Gaelic, like Modern Irish and Manx, developed out of Middle Irish. Most of modern Scotland was once Gaelic-speaking, as evidenced especially by Gaelic-language placenames. In the 2011 census of Scotland, 57,375 people (1.1% of the Scottish population aged over three years old) reported as able to speak Gaelic, 1,275 fewer than in 2001. The highest percentages of Gaelic speakers were in the Outer Hebrides. Nevertheless, there are revival efforts, and the number of speakers of the language under age 20 did not decrease between the 2001 and 2011 censuses. Outside Scotland, Canadian Gaelic is spoken mainly in Nova Scotia and Prince Edward Island. Scottish Gaelic is not an official language of either the European Union or the United Kingdom. However, it is classed as an indigenous language under the European Charter for Regional or Minority Languages, which the British government has ratified, and the Gaelic Language (Scotland) Act 2005 established a language development body, Bòrd na Gàidhlig. Aside from "Scottish Gaelic", the language may also be referred to simply as "Gaelic", pronounced /ˈɡeɪlɪk/ or /ˈɡælɪk/ in English. "Gaelic" may also refer to the Irish language. Linguistic division in early 12th century Scotland. Gaelic was commonly believed to have been brought to Scotland, in the 4th–5th centuries CE, by settlers from Ireland who founded the Gaelic kingdom of Dál Riata on Scotland's west coast in present-day Argyll. :551:66 However, archaeologist Dr Ewan Campbell has argued that there is no archaeological or placename evidence of a migration or takeover. This view of the medieval accounts is shared by other archaeologists and historians. Regardless of how it came to be spoken in the region, Gaelic in Scotland was mostly confined to Dál Riata until the eighth century, when it began expanding into Pictish areas north of the Firth of Forth and the Firth of Clyde. By 900, Pictish appears to have become extinct, completely replaced by Gaelic. :238–244 An exception might be made for the Northern Isles, however, where Pictish was more likely supplanted by Norse rather than by Gaelic. During the reign of Caustantín mac Áeda (900–943), outsiders began to refer to the region as the kingdom of Alba rather than as the kingdom of the Picts. However, though the Pictish language did not disappear suddenly, a process of Gaelicisation (which may have begun generations earlier) was clearly under way during the reigns of Caustantín and his successors. By a certain point, probably during the 11th century, all the inhabitants of Alba had become fully Gaelicised Scots, and Pictish identity was forgotten. In 1018, after the conquest of the Lothians by the Kingdom of Scotland, Gaelic reached its social, cultural, political, and geographic zenith. :16–18 Colloquial speech in Scotland had been developing independently of that in Ireland since the eighth century. For the first time, the entire region of modern-day Scotland was called Scotia in Latin, and Gaelic was the lingua Scotica. :276:554 In southern Scotland, Gaelic was strong in Galloway, adjoining areas to the north and west, West Lothian, and parts of western Midlothian. It was spoken to a lesser degree in north Ayrshire, Renfrewshire, the Clyde Valley and eastern Dumfriesshire. In south-eastern Scotland, there is no evidence that Gaelic was ever widely spoken. The ollamh rìgh (royal poet) greets King Alexander III during a Gaelic coronation ceremony at Stone, 1249. A steady shift away from Scottish Gaelic continued into and through the modern era. Some of this was driven by policy decisions by government or other organisations, some originated from social changes. In the last quarter of the 20th century, efforts began to encourage use of the language. The Endangered Languages Project lists Gaelic's status as "threatened", with "20,000 to 30,000 active users". [better source needed] UNESCO classifies Gaelic as "definitely endangered". The 1755–2001 figures are census data quoted by MacAulay. :141 The 2011 Gaelic speakers figures come from table KS206SC of the 2011 Census. The 2011 total population figure comes from table KS101SC. Note that the numbers of Gaelic speakers relate to the numbers aged 3 and over, and the percentages are calculated using those and the number of the total population aged 3 and over. The 2011 UK Census showed a total of 57,375 Gaelic speakers in Scotland (1.1% of population over three years old), of whom only 32,400 could also read and write, due to the lack of Gaelic medium education in Scotland. Compared to the 2001 Census, there has been a diminution of approximately 1,300 people. This is the smallest drop between censuses since the Gaelic language question was first asked in 1881. The Scottish Government's language minister and Bord na Gaidhlig took this as evidence that Gaelic's long decline has slowed. The main stronghold of the language continues to be the Outer Hebrides (Na h-Eileanan Siar), where the overall proportion of speakers is 52.2%. Important pockets of the language also exist in the Highlands (5.4%) and in Argyll and Bute (4.0%), and Inverness, where 4.9% speak the language. The locality with the largest absolute number is Glasgow with 5,878 such persons, who make up over 10% of all of Scotland's Gaelic speakers. Gaelic continues to decline in its traditional heartland. Between 2001 and 2011, the absolute number of Gaelic speakers fell sharply in the Western Isles (−1,745), Argyll & Bute (−694), and Highland (−634). The drop in Stornoway, the largest parish in the Western Isles by population, was especially acute, from 57.5% of the population in 1991 to 43.4% in 2011. The only parish outside the Western Isles over 40% Gaelic-speaking is Kilmuir in Northern Skye at 46%. The islands in the Inner Hebrides with significant percentages of Gaelic speakers are Tiree (38.3%), Raasay (30.4%), Skye (29.4%), Lismore (26.9%), Colonsay (20.2%), and Islay (19.0%). As a result of continued decline in the traditional Gaelic heartlands, today no civil parish in Scotland has a proportion of Gaelic speakers greater than 65% (the highest value is in Barvas, Lewis, with 64.1%). In addition, no civil parish on mainland Scotland has a proportion of Gaelic speakers greater than 20% (the highest value is in Ardnamurchan, Highland, with 19.3%). Out of a total of 871 civil parishes in Scotland, the proportion of Gaelic speakers exceeds 50% in 7 parishes, exceeds 25% in 14 parishes, and exceeds 10% in 35 parishes. Decline in traditional areas has recently been balanced by growth in the Scottish Lowlands. Between the 2001 and 2011 censuses, the number of Gaelic speakers rose in nineteen of the country's 32 council areas. The largest absolute gains were in Aberdeenshire (+526), North Lanarkshire (+305), Aberdeen City (+216), and East Ayrshire (+208). The largest relative gains were in Aberdeenshire (+0.19%), East Ayrshire (+0.18%), Moray (+0.16%), and Orkney (+0.13%). In 2014, the census of pupils in Scotland showed 497 pupils in publicly funded schools had Gaelic as the main language at home, a drop of 18% from 606 students in 2010. During the same period, Gaelic medium education in Scotland has grown, with 3,583 pupils being educated in a Gaelic-immersion environment in 2014, up from 2,638 pupils in 2009. However, even among pupils enrolled in Gaelic medium schools, 81% of primary students and 74% of secondary students report using English more often than Gaelic when speaking with their mothers at home. Gaelic has long suffered from its lack of use in educational and administrative contexts and was long suppressed. The UK government has ratified the European Charter for Regional or Minority Languages in respect of Gaelic. Along with Irish and Welsh, Gaelic is designated under Part III of the Charter, which requires the UK Government to take a range of concrete measures in the fields of education, justice, public administration, broadcasting and culture. It has not received the same degree of official recognition from the UK Government as Welsh. With the advent of devolution, however, Scottish matters have begun to receive greater attention, and it achieved a degree of official recognition when the Gaelic Language (Scotland) Act was enacted by the Scottish Parliament on 21 April 2005. Establishing the Gaelic development body, Bòrd na Gàidhlig, (BnG), on a statutory basis with a view to securing the status of the Gaelic language as an official language of Scotland commanding equal respect to the English language and to promote the use and understanding of Gaelic. Requiring BnG to prepare a National Gaelic Language Plan every five years for approval by Scottish Ministers. Requiring BnG to produce guidance on Gaelic medium education and Gaelic as a subject for education authorities. Requiring public bodies in Scotland, both Scottish public bodies and cross-border public bodies insofar as they carry out devolved functions, to develop Gaelic language plans in relation to the services they offer, if requested to do so by BnG. Following a consultation period, in which the government received many submissions, the majority of which asked that the bill be strengthened, a revised bill was published; the main alteration was that the guidance of the Bòrd is now statutory (rather than advisory). In the committee stages in the Scottish Parliament, there was much debate over whether Gaelic should be given 'equal validity' with English. Due to executive concerns about resourcing implications if this wording was used, the Education Committee settled on the concept of 'equal respect'. It is not clear what the legal force of this wording is. The Act was passed by the Scottish Parliament unanimously, with support from all sectors of the Scottish political spectrum, on 21 April 2005. Under the provisions of the Act, it will ultimately fall to BnG to secure the status of the Gaelic language as an official language of Scotland. Some commentators, such as Éamonn Ó Gribín (2006) argue that the Gaelic Act falls so far short of the status accorded to Welsh that one would be foolish or naïve to believe that any substantial change will occur in the fortunes of the language as a result of Bòrd na Gàidhlig's efforts. On 10 December 2008, to celebrate the 60th anniversary of the Universal Declaration of Human Rights, the Scottish Human Rights Commission had the UDHR translated into Gaelic for the first time. However, given there are no longer any monolingual Gaelic speakers, following an appeal in the court case of Taylor v Haughney (1982), involving the status of Gaelic in judicial proceedings, the High Court ruled against a general right to use Gaelic in court proceedings. The Scottish Qualifications Authority offer two streams of Gaelic examination across all levels of the syllabus: Gaelic for learners (equivalent to the modern foreign languages syllabus) and Gaelic for native speakers (equivalent to the English syllabus). An Comunn Gàidhealach performs assessment of spoken Gaelic, resulting in the issue of a Bronze Card, Silver Card or Gold Card. Syllabus details are available on An Comunn's website. These are not widely recognised as qualifications, but are required for those taking part in certain competitions at the annual mods. In October 2009, a new agreement was made which allows Scottish Gaelic to be used formally between Scottish Government ministers and European Union officials. The deal was signed by Britain's representative to the EU, Sir Kim Darroch, and the Scottish government. This does not give Scottish Gaelic official status in the EU, but gives it the right to be a means of formal communications in the EU's institutions. The Scottish government will have to pay for the translation from Gaelic to other European languages. The deal was received positively in Scotland; Secretary of State for Scotland Jim Murphy said the move was a strong sign of the UK government's support for Gaelic. He said that "Allowing Gaelic speakers to communicate with European institutions in their mother tongue is a progressive step forward and one which should be welcomed". Culture Minister Mike Russell said that "this is a significant step forward for the recognition of Gaelic both at home and abroad and I look forward to addressing the council in Gaelic very soon. Seeing Gaelic spoken in such a forum raises the profile of the language as we drive forward our commitment to creating a new generation of Gaelic speakers in Scotland." The Scottish Gaelic used in Machine-readable British passports differs from Irish passports in places. "Passport" is rendered Cead-siubhail (in Irish, Pas); "The European Union", Aonadh Eòrpach (in Irish, An tAontas Eorpach), while "Northern Ireland" is Èirinn a Tuath in Gaelic (the Irish equivalent is Tuaisceart Éireann). Bilingual road signs, street names, business and advertisement signage (in both Gaelic and English) are gradually being introduced throughout Gaelic-speaking regions in the Highlands and Islands, including Argyll. In many cases, this has simply meant re-adopting the traditional spelling of a name (such as Ràtagan or Loch Ailleart rather than the anglicised forms Ratagan or Lochailort respectively). Bilingual railway station signs are now more frequent than they used to be. 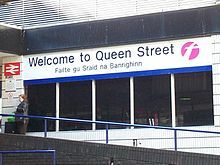 Practically all the stations in the Highland area use both English and Gaelic, and the spread of bilingual station signs is becoming ever more frequent in the Lowlands of Scotland, including areas where Gaelic has not been spoken for a long time. This has been welcomed by many supporters of the language as a means of raising its profile as well as securing its future as a 'living language' (i.e. allowing people to use it to navigate from A to B in place of English) and creating a sense of place. 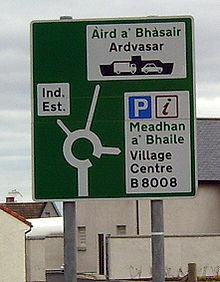 However, in some places, such as Caithness, the Highland Council's intention to introduce bilingual signage has incited controversy. The Ordnance Survey has acted in recent years to correct many of the mistakes that appear on maps. They announced in 2004 that they intended to correct them and set up a committee to determine the correct forms of Gaelic place names for their maps. Ainmean-Àite na h-Alba ("Place names in Scotland") is the national advisory partnership for Gaelic place names in Scotland. In the nineteenth century, Canadian Gaelic was the third-most widely spoken European language in British North America and Gaelic-speaking immigrant communities could be found throughout what is modern-day Canada. Gaelic poets in Canada produced a significant literary tradition. The number of Gaelic-speaking individuals and communities declined sharply, however, after the First World War. At the start of the 21st century, it was estimated that no more than 500 people in Nova Scotia still spoke Scottish Gaelic as a first language. In the 2011 Nova Scotia census, 300 people claimed to have Gaelic as their first language (a figure that may include Irish Gaelic). In the same 2011 census, 1,275 people claimed to speak Gaelic, a figure that not only included all Gaelic languages, but also those people who are not first language speakers, of whom 300 claim to have Gaelic as their "mother tongue. "[a] The Nova Scotia government maintains an Office of Gaelic Affairs (Iomairtean na Gàidhlig), dedicated to the development of Scottish Gaelic language, culture and tourism in Nova Scotia, and which estimates about 2,000 total Gaelic speakers to be in the province. As in Scotland, areas of North-Eastern Nova Scotia and Cape Breton have bilingual street signs. Nova Scotia also has Comhairle na Gàidhlig (The Gaelic Council of Nova Scotia), a non-profit society dedicated to the maintenance and promotion of the Gaelic language and culture in Maritime Canada. In 2018, the Nova Scotia government launched a new Gaelic vehicle license plate to raise awareness of the language and help fund Gaelic language and culture initiatives. Maxville Public School in Maxville, Glengarry, Ontario, Canada offers Scottish Gaelic lessons weekly. In Prince Edward Island, the Colonel Gray High School now offers both an introductory and an advanced course in Gaelic; both language and history are taught in these classes. This is the first recorded time that Gaelic has ever been taught as an official course on Prince Edward Island. The province of British Columbia is host to the Comunn Gàidhlig Bhancoubhair (The Gaelic Society of Vancouver), the Vancouver Gaelic Choir, the Victoria Gaelic Choir, as well as the annual Gaelic festival Mòd Vancouver. The city of Vancouver's Scottish Cultural Centre also holds seasonal Scottish Gaelic evening classes. The BBC operates a Gaelic-language radio station Radio nan Gàidheal as well as a television channel, BBC Alba. Launched on 19 September 2008, BBC Alba is widely available in the UK (on Freeview, Freesat, Sky and Virgin Media). It also broadcasts across Europe on the Astra 2 satellites. The channel is being operated in partnership between BBC Scotland and MG Alba – an organisation funded by the Scottish Government, which works to promote the Gaelic language in broadcasting. The ITV franchise in central Scotland, STV Central, produces a number of Scottish Gaelic programmes for both BBC Alba and its own main channel. Until BBC Alba was broadcast on Freeview, viewers were able to receive the channel TeleG, which broadcast for an hour every evening. Upon BBC Alba's launch on Freeview, it took the channel number that was previously assigned to TeleG. There are also television programmes in the language on other BBC channels and on the independent commercial channels, usually subtitled in English. The ITV franchise in the north of Scotland, STV North (formerly Grampian Television) produces some non-news programming in Scottish Gaelic. The Education (Scotland) Act 1872, which completely ignored Gaelic, and led to generations of Gaels being forbidden to speak their native language in the classroom, is now recognised as having dealt a major blow to the language. People still living can recall being beaten for speaking Gaelic in school. Even later, when these attitudes had changed, little provision was made for Gaelic medium education in Scottish schools. As late as 1958, even in Highland schools, only 20% of primary students were taught Gaelic as a subject, and only 5% were taught other subjects through the Gaelic language. Gaelic-medium playgroups for young children began to appear in Scotland during the late 1970s and early 1980s. Parent enthusiasm may have been a factor in the "establishment of the first Gaelic medium primary school units in Glasgow and Inverness in 1985". 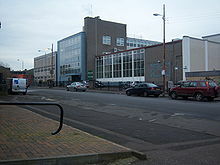 The first modern solely Gaelic-medium secondary school, Sgoil Ghàidhlig Ghlaschu ("Glasgow Gaelic School"), was opened at Woodside in Glasgow in 2006 (61 partially Gaelic-medium primary schools and approximately a dozen Gaelic-medium secondary schools also exist). According to Bòrd na Gàidhlig, a total of 2,092 primary pupils were enrolled in Gaelic-medium primary education in 2008–09, as opposed to 24 in 1985. The Columba Initiative, also known as colmcille (formerly Iomairt Cholm Cille), is a body that seeks to promote links between speakers of Scottish Gaelic and Irish. In May 2004, the Nova Scotia government announced the funding of an initiative to support the language and its culture within the province. Several public schools in Northeastern Nova Scotia and Cape Breton offer Gaelic classes as part of the high-school curriculum. The government's Gaelic Affairs offers lunch-time lessons to public servants in Halifax. Maxville Public School in Maxville, Glengarry, Ontario, Canada offers Scottish Gaelic lessons weekly, and Prince Edward Island, Canada, the Colonel Gray High School offer an introductory and an advanced course in Scottish Gaelic. A number of Scottish and some Irish universities offer full-time degrees including a Gaelic language element, usually graduating as Celtic Studies. St. Francis Xavier University, the Gaelic College of Celtic Arts and Crafts and Cape Breton University (formerly known as the "University College of Cape Breton") in Nova Scotia, Canada also offer a Celtic Studies degrees and/or Gaelic language programs. In Russia the Moscow State University offers Gaelic language, history and culture courses. The University of the Highlands and Islands offers a range of Gaelic language, history and culture courses at NC, HND, BA (ordinary), BA (Hons) and Msc, and offers opportunities for postgraduate research through the medium of Gaelic. Residential courses at Sabhal Mòr Ostaig on the Isle of Skye offer adults the chance to become fluent in Gaelic in one year. Many continue to complete degrees, or to follow up as distance learners. A number of other colleges offer a one-year certificate course, which is also available online (pending accreditation). Lews Castle College's Benbecula campus offers an independent 1-year course in Gaelic and Traditional Music (FE, SQF level 5/6). In the Western Isles, the isles of Lewis, Harris and North Uist have a Presbyterian majority (largely Church of Scotland – Eaglais na h-Alba in Gaelic, Free Church of Scotland and Free Presbyterian Church of Scotland.) The isles of South Uist and Barra have a Catholic majority. All these churches have Gaelic-speaking congregations throughout the Western Isles. Notable city congregations with regular services in Gaelic are St Columba's Church, Glasgow and Greyfriars Tolbooth & Highland Kirk, Edinburgh. Leabhar Sheirbheisean – a shorter Gaelic version of the English-language Book of Common Order – was published in 1996 by the Church of Scotland. The widespread use of English in worship has often been suggested as one of the historic reasons for the decline of Gaelic. The Church of Scotland is supportive today,[vague] but has a shortage of Gaelic-speaking ministers. 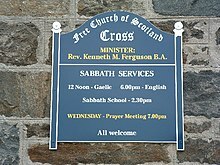 The Free Church also recently announced plans to abolish Gaelic-language communion services, citing both a lack of ministers and a desire to have their congregations united at communion time. From the sixth century to the present day, Scottish Gaelic has been used as the language of literature. Two prominent writers of the twentieth century are Anne Frater and Sorley Maclean. Gaelic has its own version of European-wide names which also have English forms, for example: Iain (John), Alasdair (Alexander), Uilleam (William), Catrìona (Catherine), Raibeart (Robert), Cairistìona (Christina), Anna (Ann), Màiri (Mary), Seumas (James), Pàdraig (Patrick) and Tòmas (Thomas). Not all traditional Gaelic names have direct equivalents in English: Oighrig, which is normally rendered as Euphemia (Effie) or Henrietta (Etta) (formerly also as Henny or even as Harriet), or, Diorbhal, which is "matched" with Dorothy, simply on the basis of a certain similarity in spelling. Many of these traditional Gaelic-only names are now regarded as old-fashioned, and hence are rarely or never used. Some names have come into Gaelic from Old Norse; for example, Somhairle ( < Somarliðr), Tormod (< Þórmóðr), Raghnall or Raonull (< Rǫgnvaldr), Torcuil (< Þórkell, Þórketill), Ìomhar (Ívarr). These are conventionally rendered in English as Sorley (or, historically, Somerled), Norman, Ronald or Ranald, Torquil and Iver (or Evander). Some Scottish names are Anglicized forms of Gaelic names: Aonghas → (Angus), Dòmhnall→ (Donald), for instance. Hamish, and the recently established Mhairi (pronounced [vaːri]) come from the Gaelic for, respectively, James, and Mary, but derive from the form of the names as they appear in the vocative case: Seumas (James) (nom.) → Sheumais (voc. ), and, Màiri (Mary) (nom.) → Mhàiri (voc.). The most common class of Gaelic surnames are those beginning with mac (Gaelic for "son"), such as MacGillEathain / MacIllEathain (MacLean). The female form is nic (Gaelic for "daughter"), so Catherine MacPhee is properly called in Gaelic, Catrìona Nic a' Phì (strictly, nic is a contraction of the Gaelic phrase nighean mhic, meaning "daughter of the son", thus NicDhòmhnaill really means "daughter of MacDonald" rather than "daughter of Donald"). The "of" part actually comes from the genitive form of the patronymic that follows the prefix; in the case of MacDhòmhnaill, Dhòmhnaill ("of Donald") is the genitive form of Dòmhnall ("Donald"). Several colours give rise to common Scottish surnames: bàn (Bain – white), ruadh (Roy – red), dubh (Dow, Duff – black), donn (Dunn – brown), buidhe (Bowie – yellow) although in Gaelic these occur as part of a fuller form such as MacGille 'son of the servant of', i.e. MacGilleBhàin, MacGilleRuaidh, MacGilleDhuibh, MacGilleDhuinn, MacGilleBhuidhe. Most varieties of Gaelic show either 8 or 9 vowel qualities (/i e ɛ a ɔ o u ɤ ɯ/)in their inventory or vowel phonemes, which can be either long or short. There are also two reduced vowels ([ə ɪ]) which only occur short. Although some vowels are strongly nasal, instances of distinctive nasality are rare. There are about nine diphthongs and a few triphthongs. Most consonants have both palatal and non-palatal counterparts, including a very rich system of liquids, nasals and trills (i.e. 3 contrasting "l" sounds, 3 contrasting "n" sounds and 3 contrasting "r" sounds). The historically voiced stops [b d̪ ɡ] have lost their voicing, so the phonemic contrast today is between unaspirated [p t̪ k] and aspirated [pʰ t̪ʰ kʰ]. In many dialects, these stops may however gain voicing through secondary articulation through a preceding nasal, for examples doras [t̪ɔɾəs̪] "door" but an doras "the door" as [ən̪ˠ d̪ɔɾəs̪] or [ə n̪ˠɔɾəs̪]. In some fixed phrases, these changes are shown permanently, as the link with the base words has been lost, as in an-dràsta "now", from an tràth-sa "this time/period". In medial and final position, the aspirated stops are preaspirated rather than aspirated. Scottish Gaelic is an Indo-European language with an inflecting morphology, verb–subject–object word order and two grammatical genders. Gaelic nouns inflect for four cases (nominative/accusative, vocative, genitive and dative) and three numbers (singular, dual and plural). They are also normally classed as either masculine or feminine. A small number of words that used to belong to the neuter class show some degree of gender confusion. For example, in some dialects am muir "the sea" behaves as a masculine noun in the nominative case, but as a feminine noun in the genitive (na mara). Nouns are marked for case in a number of ways, most commonly involving various combinations of lenition, palatalisation and suffixation. There are 12 irregular verbs. Most other verbs follow a fully predictable paradigm, although polysyllabic verbs ending in laterals can deviate from this paradigm as they show syncopation. Three non-composed combined TAM forms expressing tense, aspect and mood, i.e. non-past (future-habitual), conditional (future of the past), and past (preterite); several composed TAM forms, such as pluperfect, future perfect, present perfect, present continuous, past continuous, conditional perfect, etc. Two verbs, bi, used to attribute a notionally temporary state, action, or quality to the subject, and is, used to show a notional permanent identity or quality, have non-composed present and non-past tense forms: (bi) tha [perfective present], bidh/bithidh [imperfective non-past]; (is) is imperfective non-past, bu past and conditional. Four moods: independent (used in affirmative main clause verbs), relative (used in verbs in affirmative relative clauses), dependent (used in subordinate clauses, anti-affirmative relative clauses, and anti-affirmative main clauses), and subjunctive. Word order is strictly verb–subject–object, including questions, negative questions and negatives. Only a restricted set of preverb particles may occur before the verb. The majority of the vocabulary of Scottish Gaelic is native Celtic. There are a large number of borrowings from Latin, (muinntir, Didòmhnaich from (dies) dominica), Norse (eilean from eyland, sgeir from sker), French (seòmar from chambre) and Scots (aidh, bramar). There are also many Brythonic influences on Scottish Gaelic. Scottish Gaelic contains a number of apparently P-Celtic loanwords, but it is not always possible to disentangle P and Q Celtic words. However some common words such as monadh = Welsh mynydd, Cumbric *monidh are clearly of P-Celtic origin. In common with other Indo-European languages, the neologisms which are coined for modern concepts are typically based on Greek or Latin, although often coming through English; television, for instance, becomes telebhisean and computer becomes coimpiùtar. Some speakers use an English word even if there is a Gaelic equivalent, applying the rules of Gaelic grammar. With verbs, for instance, they will simply add the verbal suffix (-eadh, or, in Lewis, -igeadh, as in, "Tha mi a' watcheadh (Lewis, "watchigeadh") an telly" (I am watching the television), instead of "Tha mi a' coimhead air an telebhisean". This phenomenon was described over 170 years ago, by the minister who compiled the account covering the parish of Stornoway in the New Statistical Account of Scotland, and examples can be found dating to the eighteenth century. However, as Gaelic medium education grows in popularity, a newer generation of literate Gaels is becoming more familiar with modern Gaelic vocabulary. Public signage in Gaelic is becoming increasingly common throughout the Scottish Highlands. This sign is located in the bilingual port community of Mallaig. A, B, C, D, E, F, G, H, I, L, M, N, O, P, R, S, T, U. The letter h, now mostly used to indicate lenition (historically sometimes inaccurately called aspiration) of a consonant, was in general not used in the oldest orthography, as lenition was instead indicated with a dot over the lenited consonant. The letters of the alphabet were traditionally named after trees, but this custom has fallen out of use. Long vowels are marked with a grave accent (à, è, ì, ò, ù), indicated through digraphs (e.g. ao is [ɯː]) or conditioned by certain consonant environments (e.g. a u preceding a non-intervocalic nn is [uː]). Traditional spelling systems also use the acute accent on the letters á, é and ó to denote a change in vowel quality rather than length, but the reformed spellings have replaced these with the grave. Certain 18th century sources used only an acute accent along the lines of Irish, such as in the writings of Alasdair mac Mhaighstir Alasdair (1741–51) and the earliest editions (1768–90) of Duncan Ban MacIntyre. The 1767 New Testament set the standard for Scottish Gaelic. The 1981 Scottish Examination Board recommendations for Scottish Gaelic, the Gaelic Orthographic Conventions, were adopted by most publishers and agencies, although they remain controversial among some academics, most notably Ronald Black. The quality of consonants (palatalised or non-palatalised) is indicated in writing by the vowels surrounding them. So-called "slender" consonants are palatalised while "broad" consonants are neutral or velarised. The vowels e and i are classified as slender, and a, o, and u as broad. The spelling rule known as caol ri caol agus leathann ri leathann ("slender to slender and broad to broad") requires that a word-medial consonant or consonant group followed by a written i or e be also preceded by an i or e; and similarly if followed by a, o or u be also preceded by an a, o, or u. This rule sometimes leads to the insertion of an orthographic vowel that does not influence the pronunciation of the vowel. For example, plurals in Gaelic are often formed with the suffix -an [ən], for example, bròg [prɔːk] (shoe) / brògan [prɔːkən] (shoes). But because of the spelling rule, the suffix is spelled -ean (but pronounced the same, [ən]) after a slender consonant, as in muinntir [mɯi̯ɲtʲɪrʲ] ((a) people) / muinntirean [mɯi̯ɲtʲɪrʲən] (peoples) where the written e is purely a graphic vowel inserted to conform with the spelling rule because an i precedes the r.
Bilingual English/Gaelic sign at Queen Street Station in Glasgow. Tha mi an dòchas. ("I hope.") > Tha mi 'n dòchas. Gaelic orthographic rules are mostly regular; however, English sound-to-letter correspondences cannot be applied to written Gaelic. Scots English orthographic rules have also been used at various times in Gaelic writing. Notable examples of Gaelic verse composed in this manner are the Book of the Dean of Lismore and the Fernaig manuscript. Gaeltacht Irish language speaking regions in Ireland. Official Languages Act 2003 Republic of Ireland. Gàidhealtachd Scottish Gaelic speaking regions in Scotland. ^ The replies are for all Gaelic languages, including Irish. ^ a b 2011 Census of Scotland Archived 4 June 2014 at the Wayback Machine, Table QS211SC. Viewed 30 May 2014. ^ Hammarström, Harald; Forkel, Robert; Haspelmath, Martin, eds. (2017). "Scottish Gaelic". Glottolog 3.0. Jena, Germany: Max Planck Institute for the Science of Human History. ^ "Census shows decline in Gaelic speakers 'slowed'". BBC News. 26 September 2013. Archived from the original on 25 May 2017. Retrieved 17 April 2017. ^ a b "Our Community - Gaelic Affairs". gaelic.novascotia.ca. ^ "Definition of Gaelic in English by Oxford Dictionaries". Oxford Dictionaries. Archived from the original on 18 August 2018. Retrieved 5 August 2018. ^ McMahon, Sean (2012). Brewer's dictionary of Irish phrase & fable. London: Weidenfeld & Nicolson. ISBN 9781849725927. ^ Jones, Charles (1997). The Edinburgh history of the Scots language. Edinburgh University Press. ISBN 978-0-7486-0754-9. ^ Chadwick, Nora Kershaw; Dyllon, Myles (1972). The Celtic Realms. Weidenfeld & Nicolson. ISBN 978-0-7607-4284-6. ^ a b Campbell, Ewan. "Were the Scots Irish?" in Antiquity No. 75 (2001). pp. 285–292. ^ a b Clarkson, Tim (2011). The Makers of Scotland: Picts, Romans, Gaels, and Vikings. Edinburgh: Birlinn Ltd. ISBN 978-1906566296. ^ Broun, "Dunkeld", Broun, "National Identity", Forsyth, "Scotland to 1100", pp. 28–32, Woolf, "Constantine II"; cf. Bannerman, "Scottish Takeover", passim, representing the "traditional" view. ^ a b c d Withers, Charles W. J. (1984). Gaelic in Scotland, 1698–1981. Edinburgh: John Donald Publishers Ltd. ISBN 978-0859760973. ^ Dunshea, Philip M. (1 October 2013). "Druim Alban, Dorsum Britanniae– 'the Spine of Britain'". Scottish Historical Review. 92 (2): 275–289. doi:10.3366/shr.2013.0178. ^ Moray Watson (30 June 2010). Edinburgh Companion to the Gaelic Language. Edinburgh University Press. p. 8. ISBN 978-0-7486-3710-2. ^ Withers, Charles W. J. (1988). "The Geographical History of Gaelic in Scotland". In Colin H. Williams. Language in Geographic Context. ^ a b c d Devine, T M (1994). Clanship to Crofters' War: The social transformation of the Scottish Highlands (2013 ed.). Manchester University Press. ISBN 978-0-7190-9076-9. ^ Hunter, James (1976). The Making of the Crofting Community. ^ Mackenzie, Donald W. (1990–92). "The Worthy Translator: How the Scottish Gaels got the Scriptures in their own Tongue". Transactions of the Gaelic Society of Inverness. 57. ^ Kennedy, Michael (2002). Gaelic in Nova Scotia: An Economic, Cultural and Social Impact Study (PDF). Province of Nova Scotia. Archived (PDF) from the original on 4 March 2016. Retrieved 5 January 2016. ^ "Endangered Languages Project - Scottish Gaelic". Endangered Languages Project. Archived from the original on 11 October 2017. Retrieved 14 June 2017. ^ Ross, John (19 February 2009). "'Endangered' Gaelic on map of world's dead languages". The Scotsman. Archived from the original on 25 October 2017. Retrieved 25 October 2017. ^ MacAulay, Donald (1992). The Celtic Languages. Cambridge University Press. ISBN 978-0521231275. ^ 2011 Census of Scotland Archived 4 June 2014 at the Wayback Machine, Table QS211SC. Viewed 23 June 2014. ^ Scotland's Census Results Online (SCROL), Table UV12. Viewed 23 June 2014. ^ "Census shows decline in Gaelic speakers 'slowed'". BBC News Online. 26 September 2013. Archived from the original on 5 July 2014. Retrieved 23 June 2014. ^ "Census shows Gaelic declining in its heartlands". BBC News Online. 15 November 2013. Archived from the original on 5 July 2014. Retrieved 23 June 2014. ^ "Pupil Census Supplementary Data". The Scottish Government. 7 December 2011. Archived from the original on 22 January 2015. Retrieved 3 March 2015. ^ a b O'Hanlon, Fiona (2012). Lost in transition? Celtic language revitalization in Scotland and Wales: the primary to secondary school stage (Thesis). The University of Edinburgh. ^ See Kenneth MacKinnon (1991) Gaelic: A Past and Future Prospect. Edinburgh: The Saltire Society. ^ "Latest News – SHRC". Scottish Human Rights Commission. 2008-10-12. Archived from the original on 2011-04-08. Retrieved 2013-11-13. ^ "UK Ratification of the European Charter for Regional or Minority Languages. Working Paper 10 – R.Dunbar, 2003" (PDF). Archived (PDF) from the original on 26 September 2007. Retrieved 27 March 2014. ^ "An Comunn Gàidhealach - Royal National Mod : Royal National Mod". www.ancomunn.co.uk. Archived from the original on 27 June 2017. Retrieved 24 April 2017. ^ "EU green light for Scots Gaelic". BBC News Online. 7 October 2009. Retrieved 7 October 2009. ^ "Caithness councillors harden resolve against Gaelic signs". The Press and Journal. 24 October 2008. Archived from the original on 20 June 2012. Retrieved 22 December 2011. ^ "Ainmean-Àite na h-Alba - Gaelic Place-Names of Scotland - About Us". www.ainmean-aite.org. Archived from the original on 25 April 2017. Retrieved 24 April 2017. ^ Bumstead, J.M (2006). "Scots". Multicultural Canada. Archived from the original on 26 December 2012. Retrieved 2006-08-30. By 1850 Gaelic was the third most commonly spoken European language in British North America. It was spoken by as many as 200,000 British North Americans of both Scottish and Irish origin as either a first or a second language. ^ Newton, Michael (2015). Seanchaidh na Coille / Memory-Keeper of the Forest: Anthology of Scottish Gaelic Literature of Canada. Cape Breton University Press. ISBN 978-1-77206-016-4. ^ Dembling, Jonathan (2006). "Gaelic in Canada: New Evidence from an Old Census". Cànan & Cultar/language and Culture: Rannsachadh Na Gàidhlig 3. Archived from the original on 21 November 2017. Retrieved 2 January 2017. ^ Kennedy, Michael (2002). "GAELIC NOVA SCOTIA - AN ECONOMIC, CULTURAL, AND SOCIAL IMPACT STUDY" (PDF). Nova Scotia Museum. pp. 114–115. Retrieved 13 January 2019. ^ a b "National Household Survey Profile, Nova Scotia, 2011". 2.statcan.gc.ca. 8 May 2013. Archived from the original on 13 May 2014. Retrieved 15 August 2014. ^ Patten, Melanie (29 February 2016). "Rebirth of a 'sleeping' language: How N.S. is reviving its Gaelic culture". Atlantic. Archived from the original on 13 July 2018. Retrieved 12 July 2018. ^ "Nova Scotia unveils Gaelic licence plate, as it seeks to expand language". Atlantic CTV News. Bell Media. THE CANADIAN PRESS. 1 May 2018. Retrieved 2 May 2018. ^ Pupils in Scotland, 2006 Archived 1 December 2008 at the Wayback Machine from scot.gov.uk. Published February 2007, Scottish Government. ^ Pupils in Scotland, 2008 Archived 7 June 2011 at the Wayback Machine from scot.gov.uk. Published February 2009, Scottish Government. ^ Pupils in Scotland, 2009 from scotland.gov.uk. Published 27 November 2009, Scottish Government. ^ "Scottish Government: Pupils Census, Supplementary Data". Scotland.gov.uk. 14 June 2011. Archived from the original on 21 November 2011. Retrieved 27 March 2014. ^ Pagoeta, Mikel Morris (2001). Europe Phrasebook. Lonely Planet. p. 416. ISBN 978-1-86450-224-4. ^ O'Hanlon, Fiona (2012). Lost in transition? Celtic language revitalization in Scotland and Wales: the primary to secondary school stage (Thesis). The University of Edinburgh. p. 48. ^ "Gael-force wind of change in the classroom". The Scotsman. 29 October 2008. Archived from the original on 30 October 2008. Retrieved 8 June 2011. ^ "Gaelic core class increasingly popular in Nova Scotia". Canadian Broadcasting Corporation. 26 January 2015. Archived from the original on 15 November 2015. Retrieved 4 November 2015. ^ International, Radio Canada (28 January 2015). "Gaelic language slowly gaining ground in Canada". RCI | English. Archived from the original on 23 June 2017. Retrieved 3 February 2018. ^ MacLeod, Murdo (6 January 2008). "Free Church plans to scrap Gaelic communion service". The Scotsman. Edinburgh. Archived from the original on 11 January 2009. Retrieved 19 January 2008. ^ "Alba air Taghadh - beò à Inbhir Nis". BBC Radio nan Gàidheal. Retrieved 19 January 2017. ^ a b "Gaelic Orthographic Conventions" (PDF). Bòrd na Gàidhlig. October 2009. Archived (PDF) from the original on 16 January 2017. Retrieved 19 January 2017. ^ "Catrìona Anna Nic a' Phì". BBC (in Scottish Gaelic). Archived from the original on 10 September 2016. Retrieved 19 January 2017. ^ a b Cite error: The named reference sqa was invoked but never defined (see the help page). ^ Woulfe, Patrick. "Gaelic Surnames". Library Ireland. Archived from the original on 25 April 2017. Retrieved 24 April 2017. ^ Alasdair mac Mhaighstir Alasdair. "Smeòrach Chlann Raghnaill". www.moidart.org.uk. Archaeology Archive Moidart History. Archived from the original on 11 October 2017. Retrieved 24 April 2017. ^ Macbain, Alexander (1896). An Etymological Dictionary of the Gaelic Language (Digitized facsimile ed.). BiblioBazaar. ISBN 978-1-116-77321-7. ^ The Board of Celtic Studies Scotland (1998) Computer-Assisted Learning for Gaelic: Towards a Common Teaching Core. The orthographic conventions were revised by the Scottish Qualifications Authority (SQA) in 2005: "Gaelic Orthographic Conventions 2005". SQA publication BB1532. Archived from the original (PDF) on 7 May 2007. Retrieved 24 March 2007. Robertson, Charles M. (1906–07). "Scottish Gaelic Dialects", The Celtic Review, vol 3 pp. 97–113, 223–39, 319–32. For a list of words relating to Scottish Gaelic, see the Scottish Gaelic language category of words in Wiktionary, the free dictionary.